I have specific questions about your rental. How do I find out more? What is the policy for deposits? In order to complete you reservation, you will need to make a 50% deposit to secure the rental. The remaining 50% is due 30 days prior to arrival. We accept all major credit cards including MasterCard, Amex and Visa. Our secure payment processing gateway is Paypal. While we use PayPal to process all credit card reservation payments, we may in certain circumstances accept Paypal direct debit transactions. Should you wish to pay via direct debit, please advise us in your booking reservation notes. We also collect a refundable $500 security deposit along with the final payment. Refer to our rental policy here for additional details. A simple credit card reservation (i.e. no upfront deposits required) is needed to secure a rental car, private transportations, concierge services or tours. Depending on the service or service provider the full amount can be paid at the time the service commences. Please refer to our refund and cancellation policy here. If you’d like to put your vacation on hold, we are happy to work with you and issue a credit at the rate you paid. You will have one year to redeem this credit. How many people can Casa Emerald Palms accomodate? 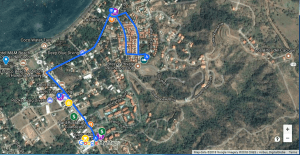 Where are the closest medical clinics and hospital to Playa del Coco? Playa del Coco is an established beach town with all the services and amenities of a big city. There are many private medical & dental clinics in town, including the Coco Medical & Dental Centre located approx. 5 mins walking to Coco beach. This new clinic has a 24-hour emergency room, minor surgical room, a lab, radiology dept. and dental centre. It offers both routine and minor emergency surgical services. In the Las Palmas condo development, there is a 24/7 medical assistance clininc run by Dr. Alejandra Mendez Rodriguez. LS Dental Clinic is located in the Pueblito Sur Commercial plaza of Las Palmas. Many health care professionals in the area are US-trained and their staff speak English and Spanish. There are two pharmacies in town (across from the Zi Lounge Restaurant and Bar and in the Pacifico Auto Mercado plaza). In the event of a medical emergency, CIMA hospital is located outside Liberia, about 20 minutes away. This medical facility is equipped with the top-tier medical technologies and can perform a variety of procedures. How far is the beach from Casa Emerald Palms? Do I need a special permit to drive in Costa Rica? Is the water safe to drink from the faucet? Yes, the tap water is fine to drink. However, if you have stomach sensitivity issues, we encourage you to use the installed 3-stage water purification system for your drinking/cooking water. A Brita water pitcher is also supplied for additional convenience. Playa del Coco has four grocery stores and one mini-mart spread across town for your convenience. Most guests and foreigners visit the Auto Mercado in the Pacifico plaza across from the Hard Rock Café Restaurant. This grocery store has a bakery, fruit area, liquor, butcher and deli sections. There is also a fairly good supply of basic household items & personal goods under one roof if you forget to bring a toothbrush, sunscreen or flip flops. What makes this grocery store unique is that it tends to cater to foreigner tastes supplying recognizable North American brand names. Just around the corner from Rich Coast Dive Shop on the road to Playa Ocotol is the Super Compro grocery store. It tend to cater more to locals as the stocked products are mostly Latin brands. However, the prices are cheaper compared to the Auto Mercado for common items such such as eggs, dairy, dish soap, etc. The other two grocery stores are Luperon and Mega Super. Right at the entrance to the Las Palmas condo development is a ‘mini mart’ version of Luperon. It’s a great place to visit if you run out of chips, paper towels, beer, snacks and ice. Will my cell phone work in Playa del Coco? Yes. More and more North American cell phone companies are providing International calling or texting plans. Before traveling to Costa Rica, contact your provider to see if one exists. If your cell phone is ‘unlocked’ you can buy a Kolbi Ice SIM card before you leave the airport, (after clearing the baggage pickup area) or at the cell phone store in the Pacifico Mall, (two stores down from the Auto Mercado). A 4 GB phone/data plan is sufficient for a weeks stay, costing $20USD. Alternatively you can buy a cheap local phone. If you rent a vehicle through Adobe, they have phones available for a nominal fee. Where can I find the nearest bank or ATM? Coco Beach has four banks with ATM’s that conduct national and international transactions. At the north end of town, just above the downtown strip are Banco National and BAC San Jose. The latter is located in the Pacifico plaza near the Auto Mercado supermarket. It dispenses both USD and Colones currencies. The former only dispenses Colones. Inside the Luperon ‘mini market’ located at the entrance to the condo development there is a Scotiabank ATM. Traveler’s Tip: Use an ATM card with the Interac PLUS or Visa Debit networks. If you require in-bank services, be sure to bring your passport. No. Casa Emerald Palms have plenty of everything for your stay. There are dedicated beach/pool towels separate from the bath towels. We encourage guests to abide by the house rules and not remove the bath towels outside of the condo. What other items are stocked in the condo for my use? cooking utensils including a measuring scale, various prep knives, whisks, spatulas, ice cream scooper, popsicle molds, meat thermometer, citrus strainer, vinaigrette shaker cup, meat tenderizer, garlic press, funnels, rice maker paddle, graters and baking/BBQ utensils, etc. Check-in is 2 pm. Check-out is 11 am. Exceptions may be made when we don’t have guests arriving or departing on the same day, just ask! The short answer? There is never a bad time to visit Playa del Coco! If your goal is to escape the winter blues, you’ll love the clear, cloudless skies between November to April (high season). Alternatively, you can visit between May through September. This is an ideal time for the angler traveler as the Papagayo winds aren’t blowing. This ‘green season’ sees afternoon showers and lush vegetation. Traveler’s Tip: If you have your heart set on certain activities, you might want to plan your trip accordingly. Several activities are only available at certain times of the year or have limited availability. Book early to avoid disappointment. We can connect you to reputable travel operators. Casa Emerald Palms is a smoke-free facility. No smoking is allowed on the premises or on the exterior terraces. We ask guests to enjoy their smoke while strolling through the neighbourhood. While Costa Rica’s natural language is Spanish, many store owners and service provides in the Coco and Liberia area speak English due to the area’s tourism growth and number of ex-pats living in the region. Traveler’s Tip: Download our printable common Spanish phrases guide here. Alternatively download and activate Google Translate on your smart phone. This app is handy when you are in a jam! We can vouch that the locals are very patient and are willing to help. 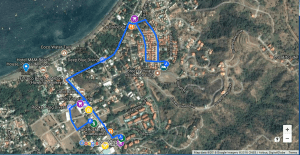 How safe is Playa del Coco? Although Playa del Coco being a popular beach town, it has a very low crime. This is because there is an active police presence. Don’t be surprised to see police regularly patrolling the downtown area by foot, car or horse. As with any travel to a foreign destination, care should always be taken with your valuables! A programmable safe is provided in the condo for this purpose. Other emergency numbers are posted on the fridge. 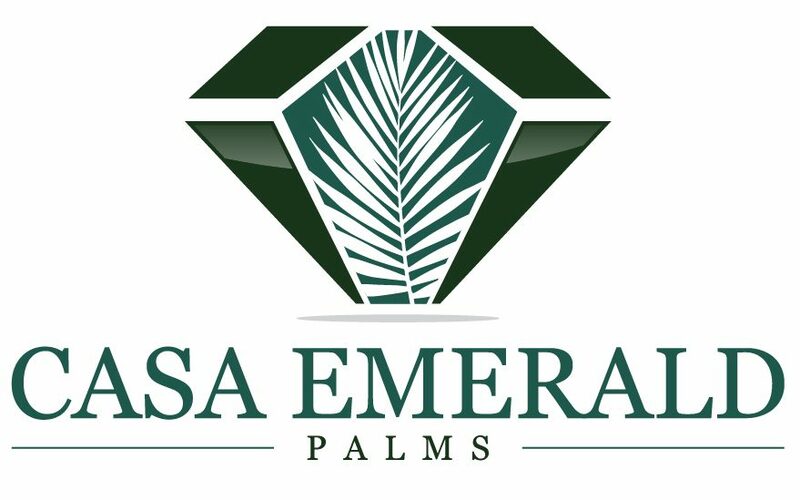 Who do I contact if I have questions while staying at Casa Emerald Palms? While staying at Casa Emerald Palms, your local concierge/support manager is your contact should anything arise. They are on call 24/7. You are always welcome to reach out to use directly as well. Please anticipate a slight delay in our response. Traveler’s tip: Please remember to advise us of your ideal method of communication and best time to contact you! Do I need to rent a car, and do I need one with 4-wheel drive? 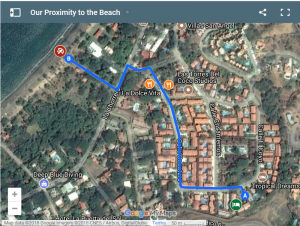 Getting around Playa del Coco is car-optional. Many guests choose to commute in town by foot or golf cart. A short cab ride can take you to the north end of town, nearby Playa Hermosa or Ocotol. 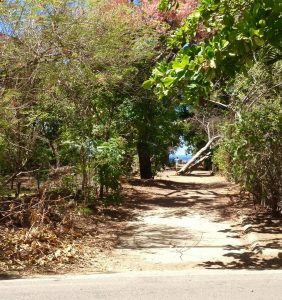 You may want to rent a 4-Wheel Drive/SUV or a car for a day or two to explore areas outside of Playa del Coco including Marino Las Baulas and Rincon del La Vieja national parks, Playa Flamingo & Las Catalinas, Tamarindo or the city centre of Liberia. Exploring Guanacaste with your own rental car is an experience not to be missed and we advise having an SUV or a vehicle with four-wheel drive to navigate the rustic roads and hillsides. If you play to stay local, consider renting a golf cart to get around easier! We can connect you to trusted local vendors during your stay. How do we get to Casa Emerald Palms once we are in Costa Rica? Other than your clothes, gadgets and personal toiletry items – nothing! Pack light. Dress attire is very casual. We recommend shorts, t-shirts, swimsuits, hats, sandals for around town. Long pants and/or jackets made from light, breathable fabrics is optional for excursions into the rainforest or after dusk. Bring at least one nice tropical wear for evenings out! Ladies, we don’t recommend high heels if you plan to walk around. However, pretty flats or wedges are appropriate. If you forget anthying, the Auto Mercado ‘all-in-one’ grocery store or downtown shops are close by. There is also a large Walmart superstore in Liberia about 25 mins away. Finally, don’t forget to bring your camera or Go Pro to capture the highlights of your holiday. If you are traveling from North America, no. The electrical code in Costa Rica is based on the same North American standards so the standard 2-prong style outlets are available. If you are coming from Europe or other areas outside of North America, an electrical converter may be required. All outlets in the condo have been upgraded to North American versions with built-in tamper-proof openings. This region has an average annual temperature of 82 degrees Fahrenheit (28 degrees Celcius). April is the warmest month when the temperature can reach 100 degrees Fahrenheit (37 degrees Celcius) in this area. November through April you will enjoy the ‘dry season’ with almost no rain. Get up to ten hours of sunshine every day. The ‘wet/green season’ is between the months of May and October, with the rainiest moths being September and October. Expect consisten high humidity of 80-85 percent. During the month of July the region get less rain. The ‘dry season’ has relatively low humidity of 60 to 75 percent. How can I book concierge or guest services after my arrival? To make the most of your Costa Rica vacation, you can book additional guest services directly with your dedicated concierge/service manager. Depending on your service of choice and availability it is advisable you book several days in advance. If you wish to include daily cleaning services, let us know by 11 am on the day prior to the start of this service. You will likely be asked to pay the cleaning staff directly. Are there daily cleaning services provided?